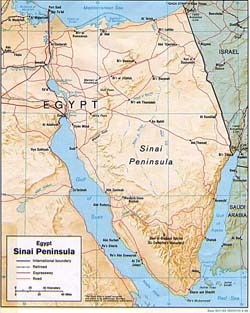 It has been alleged that foreign control of large swathes of the Sinai Peninsula has been obtained through fraud. The claim was made by Egyptian writer and intellectual Fahmi Howeidi, who revealed that over “800 sq.km of the peninsula has been obtained by foreigners, including Israelis, by fraudulent means”. An additional 1000 residential units in the Red Sea resort of Sharm El-Sheikh’s have also come under foreign control fraudulently. The land deals in question have been concluded by an Egyptian corporation that is, claimed Mr. Howeidi, a front for a German company which used eleven lawyers to “fix 450 judicial rulings through which the registration and payments outside Egypt took place successfully”. In an article published by the Kuwaiti newspaper Al-Row’ya (The Vision), Mr. Howeidi said, “The worst aspect of this case is that all these agreements were in favour of Israeli owners and companies.” In such a situation, he said, we are looking at something far more serious than “tourism and foreign investment; it becomes a scheme with political ramifications obvious to everybody”. At a time when the Egyptian media has warnings about Palestinians crossing illegally into Sinai, he added, Israelis are working in secret to put their hands on whatever they can get from real estate and lands in the Egyptian Sinai. Howeidi drew attention to the fact that this is not the first such case, “as the Syaj corporation was accused similarly when it bought 6500 square meters of land located on the Taba borders and it appeared that one of the financiers of the deal was the Israeli Lemerre Company”. It was later also discovered that one of the participants in this was a former Israeli general who had published two articles in American newspapers in 2000 and 2002 saying that the ruling in favour of Egypt on land in Taba did not help Israel’s national security and that it should be reviewed in order to address this “gap”.